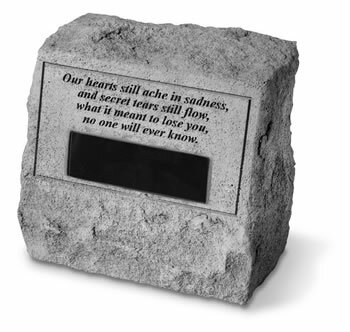 Personalized Memorial Stone With Urn Our Hearts Still Ache..
Home > Memorials > Personalized Memorials > Personalized Memorial Stone With Urn Our Hearts Still Ache..
Beautiful memorial headstone has an urn. The headstone has a rich texture with the look, feel and weight of true stone. Made of cast stone, it is weatherproof and has year-round durability. A container in the bottom can hold a memento of a loved one or a beloved pet. Urn: 33 cubic inches in volume. Holds the ashes of a 38 lb pet. Personalize with up to 3 lines with a maximum of 21 characters per line. Personalization is etched on a black marble plaque. This is an awesome memorial stone. It is exactly what we wanted. Very nice!